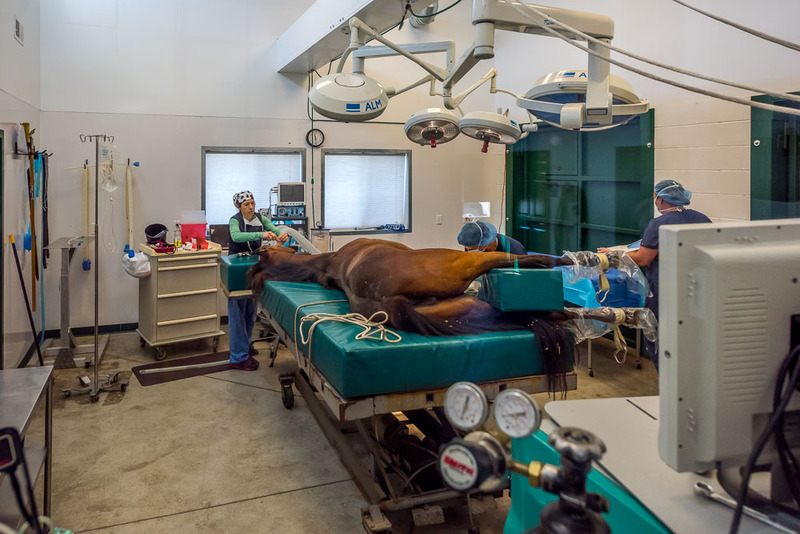 The focus of surgery at our hospital is state-of-the-art care for horses with orthopedic injuries involving bones, joints, tendons, ligaments and soft tissues. McKinlay & Peters Equine Hospital has the surgical expertise, technical staff, facility and equipment to allow us to provide surgical care for horses in need of arthroscopic procedures, fracture repair, treatment of tendon/ligament injuries and repair of the limbs following trauma and/or laceration. Surgery is employed to return adult horses to performance, as well as to prolong their lives and improve their quality of life. We feel extremely fortunate to have Dr. Bob Schneider, a world renowned authority in equine lameness and surgery, as part of the MPEH team. His expertise and experience combined with a splendid facility, staff and equipment make our hospital THE place to go for all your orthopedic needs. In addition to performance and pleasure horses, we provide surgical treatment for foals with orthopedic problems that frequently develop as they are growing. This includes straightening crooked legs, managing contracted tendons and treating growth deformities and lameness caused by diseases like osteochondrosis. We also treat and repair traumatic injuries in foals. We also perform many other types of surgery in our hospital. Drs. McKinlay and Peters have developed expertise in general surgical procedures, with more than 40 years combined experience. General surgical procedures performed at our hospital include but are not limited to: reproductive surgery – removal of ovaries in mares and retained testicles in stallions, extraction of teeth and sinus surgery. Wounds and lacerations are common in horses, and have serious consequences when deeper structures are involved. Management of these injuries frequently require hospitalization, surgical intervention and aggressive therapy to avoid long term consequences. While our surgical focus began with orthopedic, traumatic and general/elective surgery, the variety of surgery has, and will continue to expand.